Here we have clips of a selection of Aine's songs and some background information. Summer Days in Wildwood is a about a young couple who meet while on summer holidays in Wildwood, New Jersey, co-written by Aine and Nuala Woods. You Shone a Light for Me is about the hope the birth of a new baby brings to a family during a difficult time. Written by Nuala Woods. The 'New York Grand Marshall' song is sung by Aine Woods as a tribute to Tommy Smyth who was the New York grand Marshall in 2008. The song tells Tommys story of emigration from Knockbridge, Co. Louth, Ireland in 1963. It describes his rise to fame as an ESPN TV presenter in America where he now lives. The song includes Tommys famous phrase "another in the back of the old onion bag". 'Flash The lights' is a witty song about livibg along the border in Ireland. It makes reference to the custom of motorists flashing their headlights to warn other road users. It hits the nail on the head about life along the border. 'Flash The Lights is Aine's first album which also includes the song 'lizzy Was Only Seventeen'. This is a true story about Aine's Great-Aunt from Cullyhanna, Co. Armagh who emigrated to America on Saint patricks Day 1905. Like most emigrants of that era, Lizzy never made it back to Ireland. 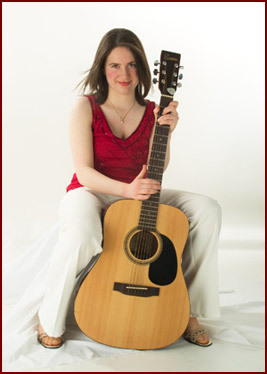 All Songe are sung by Aine Woods & written by Nuala Woods. Instrumentals by Aine Woods & Padraig Woods.